If you are not sitting, do so. If you don’t have nose tissue, get some. This chapter is going to be a ride of disbelief. The Ontario Government has created the most complex, convoluted pricing system in the world. The effects of this pricing system means that producers get paid to not produce power. And it also means that when demand is low but output is in excess to that demand, that the rest is dumped to the US, which ratepayers here in Ontario pay for. This is correct, because demand is low in Ontario since 2005, all excess power from the loss of demand is sent to the US which we subsidize with our rates. 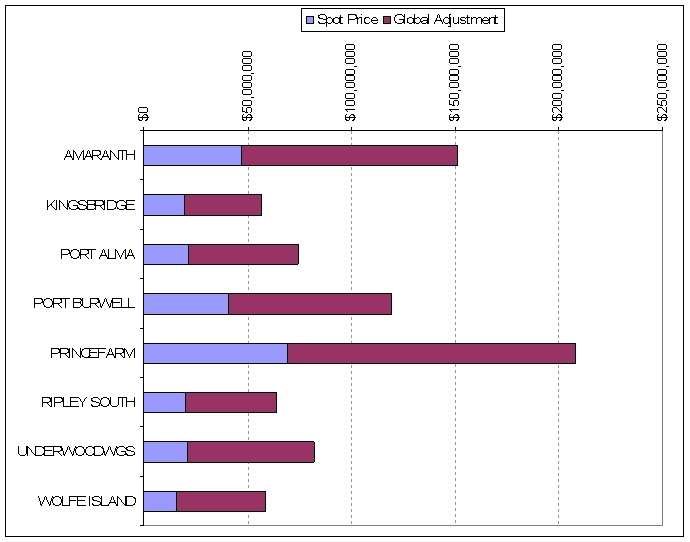 Wind turbine companies are paid a fixed price for wind, somewhere between $90/mWh and $140/mWh regardless of what the spot price is on an hourly basis. It appears various projects got a different price guarantee at different times. The controversial Samsung deal got 14c/kWh or $140/mWh. Until that differing pricing structure is obtained, this chapter will use $120/mWh for the calculations below, subject to change once the actual numbers arrive. But the $120 will be close enough for now for you to get a picture of what’s going on. But since the wind industry is guaranteed $120/mWh, something must make up the difference when the spot price is below that value. They get only the $120 when the spot price is higher. But this occurred only 2000 hours over a 5 year period, basically nothing. That difference between the guaranteed price and the spot price is made up with the Global Adjustment (GA), which appears on some people’s utility bill as the Provincial benefit. See details here on what the definition of the GA is along with the values. The Provincial Benefit (PB) rate for those who have it can see the monthly rate here. If the PB is negative then the spot price is high and you are a net beneficiary. However, when the PB is positive, then you are paying more for power. The PB goes positive when demand is low and excess power is being generated. That is, this is the compensation to producers for there not being enough demand for their product. It’s worth explaining what this Global Adjustment means with an analogy. Assume you travel every saturday morning for a few hours to go visit your elderly parents. Each Saturday morning on the way out you fill the tank at the station on the corner putting in $100. You’ve done this for years. But now that we are in a recession and budgets are squeezed, you decided to go only once every two weeks. Demand hence drops. Now that poor station owner up the corner only gets half the profit from you as before. So the government steps in an passes a law so that the station owner gets a guaranteed price for the fuel sold. 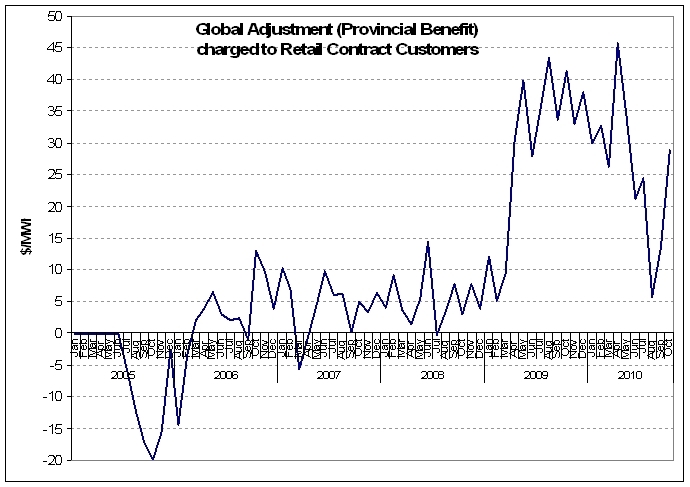 Should the demand drop, a “Global Adjustment” is added to top up the revenue. So when you visit every other saturday, you fill up, but your bill is double with an added line item “Global Adjustment – $100.” So now you pay $200 to fill the tank for half the time you travel. This is exactly what the Global Adjustment does for all power producers, not just wind operators. Understand also that when you attempt to conserve, you are lowing demand, which is lost revenue for the producers, which increases the Global Adjustment, which is added to your bills so you end up paying more for conserving. Remember Max in the movie Grumpier Old Men, when he said “Holly Molly!” at things that surprised him. Well, this is apropos for the following. Glad you were sitting down? This is correct, $814 MILLION, give or take a few tens of millions, paid since 2006 for wind power in the province. Every dime from your bills. Clearly the Global Adjustment has been the biggest increase in revenue for wind producers. 2010 is projected from the end of Aug into a full year. 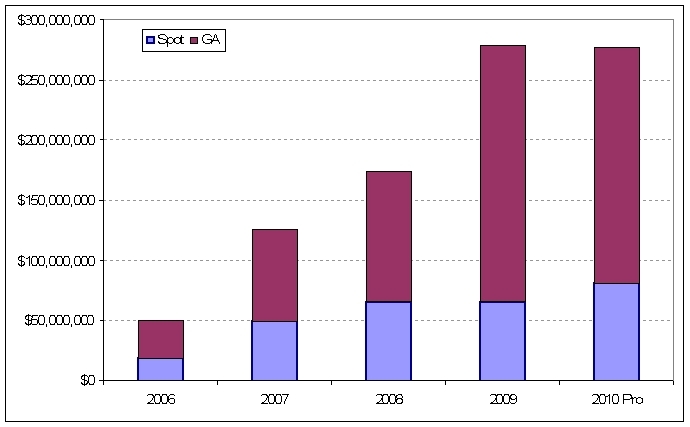 As of Aug 2010, wind production has significantly dropped off as wind in this year was lower than the previous 4 years. So far the 5 years has been increasing close to a power curve (red dashed line). 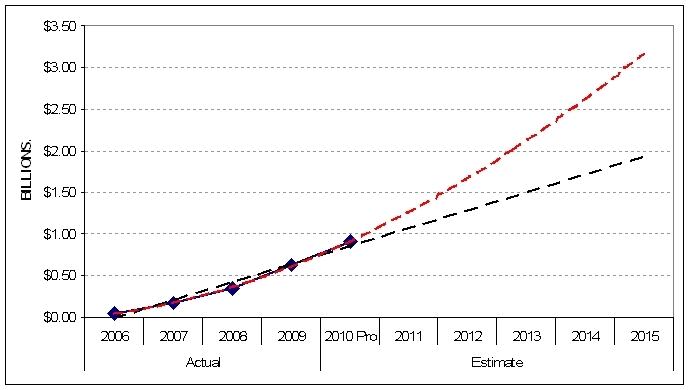 A linear line has also been projected for the next 5 years (black dashed line). The future will likely be between the two closer to the power curve. Though this does not include many more wind projects are in the pipe, so depending what happens in that regard for the next five years, the future accumulative cost curve could be a higher power curve. Power curves, growth curves, are unsustainable. They have a doubling period such that each new double period is the same value as all previous doubled periods combined. You can see this with the red projection. That’s what growth is. The current $824Million balloons to just over $3BILLION. For this year alone, growth in the accumulated costs is 44% from 2009, though down from previous years of 80-100% per year. These costs for wind have a great potential, or threat, of swamping the pricing system into bankruptcy (if it already isn’t.). Now we are told by the government that the costs will come down as more wind projects are built. Back in the 1960’s we were assured that nuke plants would make power too cheap to meter. If not already, you can start crying. Then each of those records was added together for each year and each farm. This entry was posted on Wednesday, October 6th, 2010 at 11:52 pm and is filed under Uncategorized. You can follow any responses to this entry through the RSS 2.0 feed. You can leave a response, or trackback from your own site. OH! But I’m just a NIMBY that doesn’t understand climate change and the need to ensure that we break the economy of Ontario so that we can join together with other bankrupt economies as we all understand that misery loves company! It even gets worse as our school children have been infiltrated by the greenwash spin paid for with our taxes. Now the common sense people have become “Enemies of the majority of People” from municipal government though provincial government up to and including federal government. Is a global revolt in a Martin Luther King or Mohandas K Ghandi style of peaceful civil disobedience our only recourse to stop this madness? Thank you for this post!….I will be handing out copies to the voters in our Municipal Election …….this will explain clearly to them why they can’t afford to live in their homes anymore! It will also go a long way in explaining to folks in Small Businesses why people are leaving this Province instead of moving into it! I have receive a newsletter from Brookfield power which indicates that wind power helps reduce electricity prices. According to the CEO of Garrard Hassan, wind generated electricity is as cheap on wind days as coal-generated electricity, which drives down power prices. He added that in parts of Texas, some utilities are using wind power because it’s the cheapest type of energy. According to Iowa Policy Project report, wind power in Iowa has produced enough energy to satisfy 17% to 20% of the state’s electricity needs and contributed to electricity prices increasing at a slower rate than the national average. Any comment on this kind of misleading info? I like how they specify that wind is as cheap as coal only on windy days, wind providing only 25% of it’s nameplate capacity over the year. I am interested in knowing if wind energy has an influence on the GA price. By Brookfield’s propaganda it appears to be the case. The only way to know for sure is to get the numbers and check. That may be difficult if the company is private, they may not be willing to post the raw data. Until then I don’t believe a word the wind industry says.